Tooth Pain? 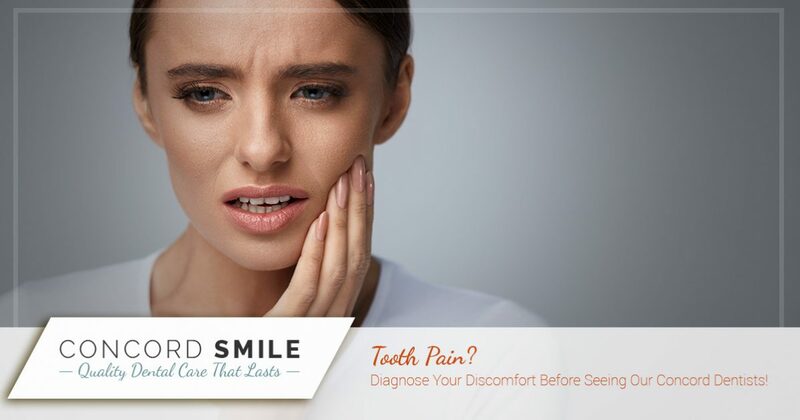 Diagnose Your Discomfort Before Seeing Our Concord Dentists! The human mouth is a complex component that is vital for many of your daily activities. For many people, tooth pain can prove to be an uncomfortable and disruptive experience. It’s important to be proactive if experience tooth discomfort, as even minor problems can quickly turn into medical emergencies. If you find yourself dealing with oral pain, it would be wise to visit a local dentist for assistance. California families have been coming to Concord Smile for years to receive the best services for patients of all ages. We provide comprehensive and cost-effective restorative, cosmetic, and general dentistry to Concord and beyond. Our family dentists are trained to enhance smiles of all ages, and we’re here and ready to help you with any problems. Today, we’ll highlight a few common tooth pains that patients suffer from when visiting our dental office. Remember that every situation is different, and this blog post cannot substitute for assistance from a live professional. When finished, be sure to schedule your dental exam with us today! This problem is the most common among patients we see and often consists of mild discomfort as opposed to outright pain. Most people express it as a deep, irritating problem that is never thought of as alarming. If left untreated, this issue can become worse, causing more discomfort. Patients who rely on painkillers for a treatment will only prolong dental intervention, putting your smile at risk. We recommend scheduling a dental exam to ensure your teeth are safe from decay. Sharp, stabbing pains in your teeth while eating can be indicative of a serious problem. In many patients we treat, the source of this problem can be sourced back to tooth decay. Oftentimes, cavities will be at the root cause for these pains. Others who suffer from this ailment may instead find small fractures in their tooth upon examination. Another common problem people encounter is excessive tooth sensitivity when eating or drinking. A lot of times, this is caused by the decay of your teeth’s outer protection, or the enamel. The lawyer beneath is comprised of dentin, which contains tiny nerve endings. When the enamel erodes, your tooth can be left open to direct contact with breezes, hot foods, freezing drinks, and so on. We recommend seeing your local dentist to find the cause for your sensitivity. Intermittent “stabbing” pains can prove very disruptive. Patients who report this pain often note that it can affect several teeth, and often occurs as a reaction to an activity such as eating, breathing, and so on. While sporadic and uncomfortable, a simple dental exam can determine the issue and provide your dentist with expert solutions. One uncomfortable situation occurs when your tooth is causing extreme pain. Most often, you will experience a swollen, throbbing pain, which definitely necessitates the need for urgent dental services. In most cases, the tooth or gums are dealing with an infection, which may promote the growth of an abscess. Be sure to schedule an appointment right away if this sounds like your problem! There are many causes of tooth pain, and in most cases, only one way to treat them. Concord Smile is proud to be your trusted family dentist, delivering proud results with safe ingredients made here in the USA. If you’re in need of emergency or general dentistry services in the Concord area, be sure to contact us today for an exam!